Sunda and Upasunda were two demon brothers. They were cursed to die at each other's hands but they loved each other too much that they can't inflict any pain on the other. Tired of the destruction they had caused on earth, Brahma approached Vishwakarma, the heavenly architect, to find a solution. They decided to create a woman so beautiful that nobody could take their eyes off her. Accordingly, Vishwakarma created the exquistly beautiful Tilottama, seeing whom even Shiva could not remove his gaze. Brahma then instructed her to meet the demons. 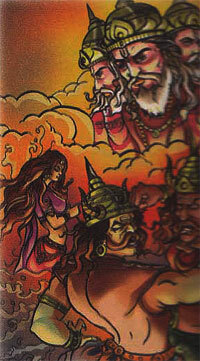 Tilottama appeared before the demons and seeing her, both brothers fell for her charms. They both wanted to marry her and thus, a fierce enmity followed. They took up arms against each other and died fighting. Unfortunately, Tilottama's charms kept captivating one and all. So Brahma gave curse that nobody would be able to cast his eyes on her for too long.